Love finds us, passes through us, continues. Heather Mulgrew’s world has long been mapped out: after graduating she's going to travel abroad with her friends for one last summer of freedom before settling down to begin a great career in the city. What Heather hadn't planned was meeting a handsome stranger on an overnight train from Paris, or for that encounter to change her life. Jack is everything Heather is not. 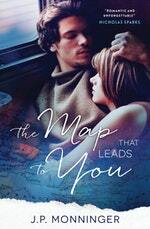 A passionate adventurer, he challenges Heather to abandon her itinerary and join him on a romantic journey through Europe, following a path set out in his grandfather's journal. From the winding canals of Amsterdam to the cobbled streets of Prague, with Jack by her side Heather begins to see the world with new eyes - and question her choices for the future. But as autumn draws nearer, so does their inevitable return to real life. With hundreds of reasons keeping them apart, can they find one to stay together? Or have they been lying to each other all along . . . ? Here’s the thing: the rest of it wouldn’t have happened if the train to Amsterdam hadn’t been crowded. It was that kind of obnoxious crowded, with everyone greedy for space, every one annoyed that the train was overbooked and jammed, so I kept my head down once I had a seat, and I tried not to look up. I was reading The Sun Also Rises, which is a cliché, of course— recent college grad reading Hemingway on her first trip to Europe with her two friends—but I didn’t care. I had already made Constance and Amy drink coffee and cognac at Les Deux Magots, and I had walked the Left Bank in Paris and sat with the pigeons alone in the Jardin du Luxembourg. I didn’t want to leave Paris. I didn’t want to leave its wide boulevards, the men playing boules in the Tuileries, the cafés, the harsh swallows of strong coffee, the funny little horns on the scooters, the paintings and museums and the rich crêpes. I didn’t want to leave the early mornings when the café workers swept the cobblestones and rinsed down their areas with black hoses and silver water, or the evenings, either, when sometimes you smelled smoke, or chestnuts, and the old men with the long fishing poles sat on their three-legged stools and threw their lines baited with maggots into the Seine. I didn’t want to leave the booksellers along the river, the moldy stalls lined with old, yellowed books, the landscape painters who came and spread their oils across stretched canvas, attempting to capture what could never be captured but only hinted at, turned into a ghost of what the city held. I didn’t want to leave Shakespeare & Co., the En­glish bookstore, the echo, the long, long echo of Hemingway and Fitzgerald, of nights splashing in the Ritz fountain, or squinty- eyed Joyce nibbling through his prose like a mouse hungry for print. I didn’t want to leave the gargoyles, either, the surprising, watchful stone eyes staring down from cathedrals, from Notre Dame and a hundred other churches, their white faces sometimes streaked with mysterious black, as if stone could hold tears and release them over centuries. They say you can never leave Paris; that it must leave you if it chooses to go. I tried to take Paris with me. In Paris, I had read A Moveable Feast, and A Farewell to Arms, and Death in the Afternoon. I had them all on my iPad, a mini-Hemingway portable library, and al­though I was traveling with Constance and Amy, I was also travel­ing with Hemingway. Love The Map That Leads To You? Subscribe to Read More to find out about similar books.